Why Do I Own This? is a column exploring the weirder pop-culture flotsam and jetsam that washes up in the lives of A.V. Club writers, the impulses that drive us to acquire such things, and the motives for clinging to them long after their ephemeral eras pass. What is it? A pint glass from Pacific Pizza, a small restaurant on the main drag in Forks, Washington, the little town on the Olympic Peninsula where Twilight was ostensibly set. While the glass itself is fairly straightforward in its depiction of an “Italian” chef, the notation that the restaurant is located in “Twilight, U.S.A.” is probably why I’ve held onto it. How did I get it? When I started dating my now-husband, he was living in Seattle and I’d frequently fly up to visit him. Before one visit, Andrew and I decided to take a driving vacation to somewhere near Seattle, and while I’ve heard Portland’s very nice, I pushed for a trip around the peninsula and through Forks. It’s no great secret that I have a bit of a fondness for the Twilight saga, despite its many, many limitations. I also love kitschy tourist attractions, so Forks, a struggling logging town that basically turned its economic climate around based on its mention in a silly book, seemed like a no-brainer destination for me. Andrew took some convincing, but he was ultimately a good sport about it, even agreeing to stay in a Twilight-themed hotel room in town. So we ended up in Forks, shamefully taking pictures in front of the town welcome sign featured in the movie and grousing (on my part, at least) about how the model of truck that the town displays as Bella’s isn’t the same as in the movie. When it came time to dine, we could have gone for the restaurants advertising Twilight-related dining specials, but we opted for Pacific Pizza, which we viewed as a little more subdued. It’s worth noting that we’d also spent the whole day trying to buy some sort of Twilight-related souvenir but failed miserably. That’s not for lack of options: When I was there, Forks had at least three large stores that sold exclusively Twilight-related goods. Unfortunately for our souvenir buying, though, most Twilight-related items are hideous, all glittery and covered with coy witticisms about Edward breaking headboards. Most of the T-shirts I couldn’t even talk myself into wearing exclusively in the privacy of my own home, and that’s saying something. That’s why, when our drinks came at Pacific Pizza in these totally charming little glasses, I may or may not have slipped one into my purse after paying the tab. It was a horrible thing to do and I’m sure they would have sold me one if I’d asked, but I stole one anyway, and I’m only a little bit repentant about it. What’s its cultural significance? 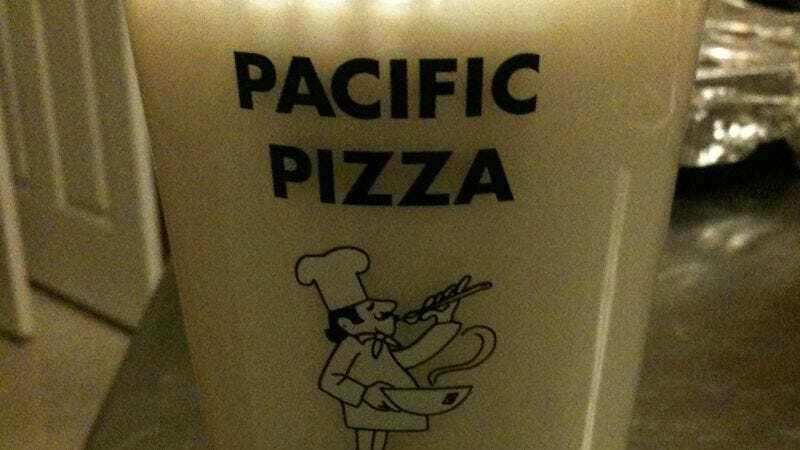 While the Pacific Pizza pint glass is fairly standard issue as far as glassware goes, every time I drink from it I’m reminded not just of Twilight, but of a lovely trip I once took to Forks, a little town that doesn’t have a lot going on, but is nice enough all the same. Why would I get rid of it? I don’t think I would, really, unless it broke or I decided to make the very adult move to just having one type of nice, logo-less glassware in the house. How much could I get for it? As far as I can tell, no one’s ever sold one on eBay or anything, so I’m not really sure. Maybe $5? What are the chances I’ll keep it? The chances are pretty good. Unlike a lot of the other crap I own, this glass is actually useful, in that I can drink things out of it or use it to hold pencils. That it’s Twilight-related is just a nice bonus.